The experience of our first winding device as well as the designing experience of the previous 400 years proves to be useful for creating universal contrivance that is tolerant to wide variations of bobbins sizes and forms. 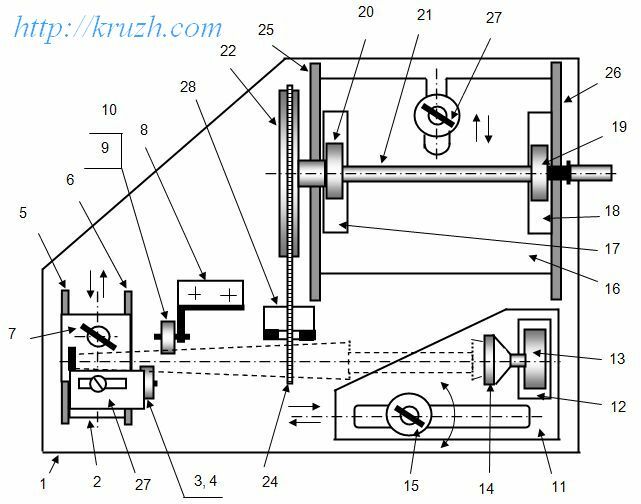 Universal model is to combine all the best of ancient winding principles together with possibilities of modern details (ball-bearings) and materials (plastics, aluminum alloy, ball bearings). Cinematic schedule of the advanced device is shown on Fig.4.9 and Fig.4.10. The winding device can be tuned up any Russian bobbin. The bobbin is inserted into the belt ring 24 and its handle is set into the space between ball-bearings 3, 4, 9, 10 (Fig.4.11). Four functional units are set on the basic platform 1. 1. The left movable bobbin bearing contains the basis 2 with ball-bearings 3 and 4. The basis 2 can move between guiding slats 5 and 6. It be fixed with a wing-nut 7. 2. The left unmovable bobbin bearing consists of the basis 8 and pair of ball-bearings 9 and 10. 4. The hand drive unit contains the basis 16 with the poles 17, 18 for the ball-bearings 19, 20. The sheave 21 is stretched on the left end of the axe 22, on the right end – the drive handle 23. The transmission belt 24 surrounds the bobbin handle that is marked with a dotted line. The basis 16 can be moved between the guiding slats 25, 26. It is fixed with the wing-nut 27. The chuck 14 is brought to the bobbin head. By some movements of the basis 2, 11, 16 the bobbin is captured between the chuck 14 and the restrictor 27. 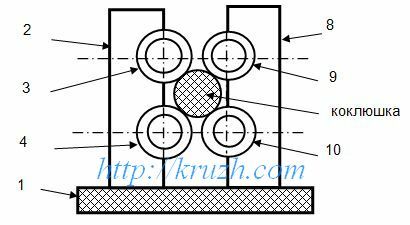 Dispersion of the bobbin handle diameter is compensated due to movements of basis 2. 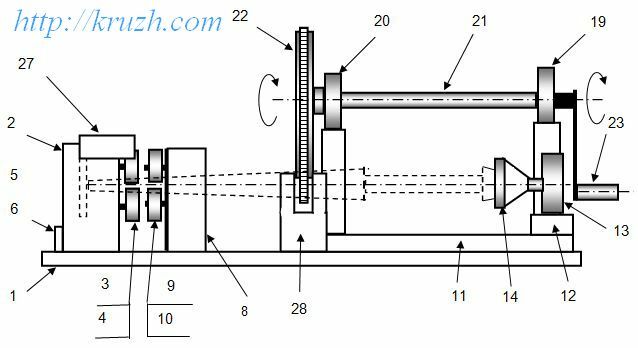 Shift of the basis 16 is used to control the belt tension and the bobbin pressing to ball-bearings 9 and 10. If a bobbin is made of soft wood, the ball-bearings can remain tracks on the surface. In this case it is recommended to put rubber rings on the ball-bearings. Shifting of the drive belt 24 along the rotating bobbin are prevented with the fork 28. The gear coefficient from the drive sheave to the bobbin variates from 4:1 to 5:1 depending on the bobbin handle diameter. The device is shown on the photo (Fig.4.12). Testing of the device confirmed its fitness to variations of bobbin sizes and forms in wide ranges. Four functional units are set on the basic platform. 1. The left movable bobbin bearing contains the basis with two ball-bearings. The basis can move between guiding slats. It can be fixed with a wing-nut. 2. The left unmovable bobbin bearing consists of the basis and pair of ball-bearings. 3. The right bobbin bearing contains the movable basis. The pole for the ball-bearing is set on the basis. The cup chuck is mounted into the ball-bearing. The basis can be shifted at any direction on the basis plane as well be rotated around the fixing screw with the wing-nut. 4. The hand drive unit contains the basis with the poles for the ball-bearings. The sheave is stretched on the left end of the axe, on the right end – the drive handle. The winding device can be tuned up any Russian bobbin. The bobbin is inserted into the belt ring and its handle is set into the space between four ball-bearings. The philosopical question can arise – is the universal winding device needed for bobbin lace making? It would be correct to ask – who needs for the universal device? Certainly it is not necessary at a specialized workshop where lace makers use standard bobbins only. They have no time to ajust any equipment. Moreover the bobbin winding will be performed at special work place since any efficient mnufacture demands division of labour. The most skilled lace makers are to be free from simple auxiliary work like bobbin winding. That is another affair when lace is plated at home. 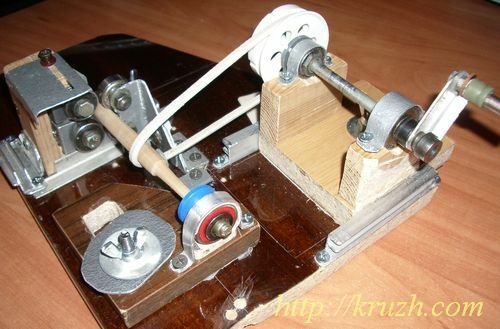 All the operations, very simple and complicated, a lace maker is perfom herself. In that case different equipment is needed including devices that are independent of the bobbin sizes and forms, in other words – universal devices. However efficient methods are worked out in domestic conditions too. Lace maker little by little gets habits to use the best means and methods. She works out her own “standards”.